A leading hospital in the Caribbean is offering another first that could save the lives of heart patients across the Caribbean and the world. Health City Cayman Islands, the first hospital in the English-speaking Caribbean to use robotic navigation for joint replacements and the first to install two artificial hearts or left ventricle assist devices (LVADs), is now offering cryoablation, a highly effective procedure for patients with atrial fibrillation, a common rhythm disorder of the heart in which people get irregular palpitations, which can lead to breathlessness and strokes. “It’s also responsible for a lot of morbidity and lifestyle issues for the patient and the healthcare cost of patients with atrial fibrillation on the community is pretty huge,” said Dr. Ravi Kishore, Chief Interventional Cardiologist and Electrophysiologist of the Joint Commission International-accredited tertiary care facility founded by renowned heart surgeon and humanitarian Dr. Devi Shetty. Peter Tuckey, originally from England, has lived in Jamaica since 1962, but when his heart developed atrial fibrillation, he tried hospitals in the United States and the Caribbean with little success. He was delighted and relieved to find his cure at Health City Cayman Islands. “It’s just that it’s an excellent facility and I’m so happy that it’s close to Jamaica … I’ll be back to exercising, back to golf and back to a drink or two, so everything’s on the up,” explained Tuckey after a Health City team led by Dr. Kishore treated his fibrillation with the innovative cryoablation procedure. Health City can help manage atrial fibrillation with medications and radiofrequency ablation, but there are imperfections with those methods. The new technology introduces a deflated cryoballoon into the heart. “Through this balloon we can introduce a liquid, which cools and dilates the balloon, and then freezes whichever structure it is put into,” explained Dr. Kishore. Doctors introduce the balloon catheter into the groin and thread it into the pulmonary veins, located in the back of the heart, where the impulses that trigger the atrial fibrillation come from, and then inflate the balloon and freeze the vein for about two to three minutes, quickly and effectively destroying the source of the fibrillation. Dr. Kishore reports that cryoablation is simpler, more effective and has fewer complications than radiofrequency ablation, which burns the affected area with radio waves. 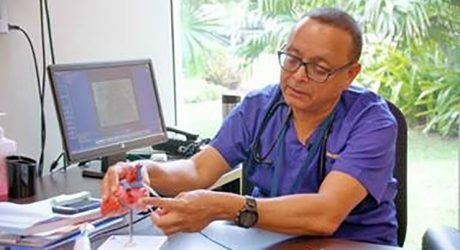 Even though they only introduced the cryoablation technique in the past few weeks, his teams have already performed the 60- to 90-minute procedure on five patients, all of whom were discharged within a day. “We found it a very user-friendly technology and the outcomes were fantastic,” Dr. Kishore said. With Health City now offering this pioneering procedure, patients will be saved long and expensive trips. Health City is possibly the only location in the English-speaking Caribbean performing cryoblation for atrial fibrillation, for which people previously had to travel to the United States or the United Kingdom.